A Quilter's Table: The Improv Stripes QAL Begins! So the Improv Stripes QAL begins today! Start by cutting a bunch of skinny strips. Lengths do not matter, but if you want a look similar to mine, angle your strips as shown below, with one end approximately 1" wide, and the other slightly less. It doesn't hurt to go as low as 1/2" on one end. When strips are sewn together, that strip basically disappears at the skinny end, and that's an interesting element to add into the mix. Of course if you want to work with wider strips, go for it! 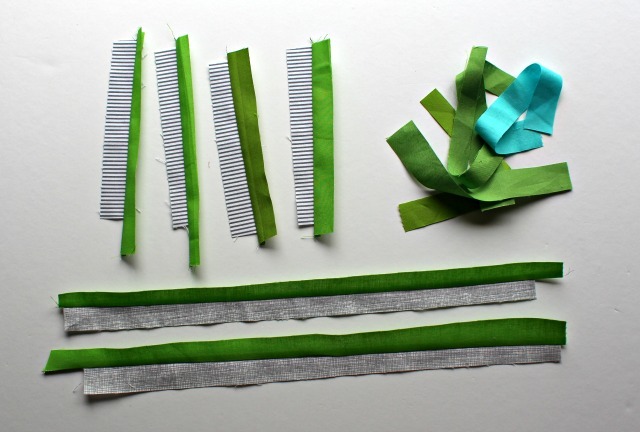 Follow the same method in cutting your contrasting strips, and begin sewing pairs together. 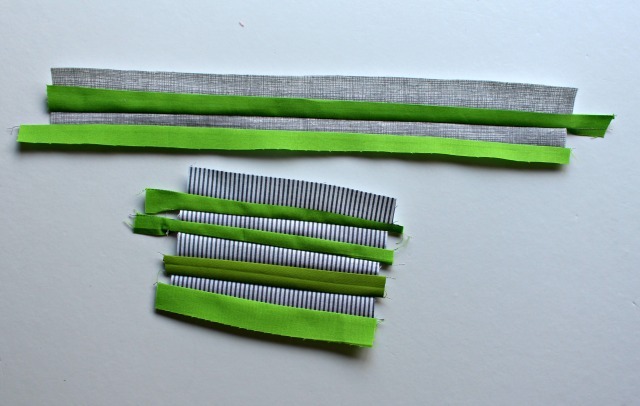 If you like, combine stripe sets to add even more variety, and do keep any little bits you trim as you go, as they may find a home in your finished piece. Once your pairs are sewn, press them, then begin sewing pairs into larger sets. It's ok for the ends to be uneven. And it's also ok - good in fact - to have a variety of sizes of stripe sets. 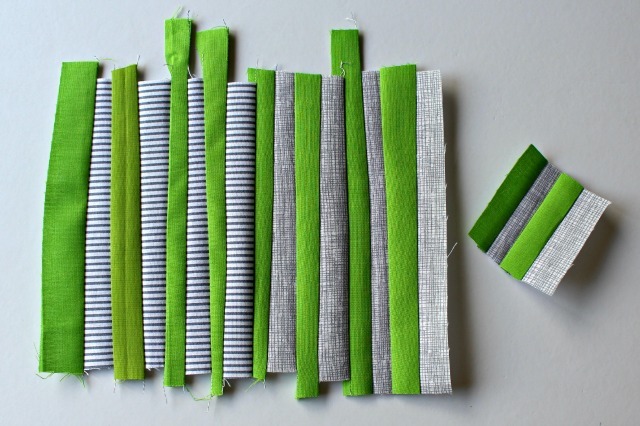 If you like, combine stripe sets to add even more variety, and do keep any little bits you trim as you go, as they may find a home in your finished piece. 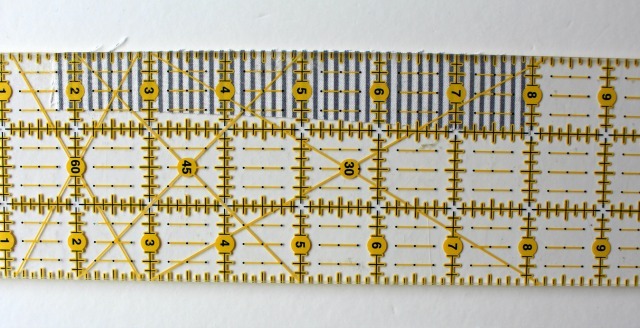 Don't press again, though, until you have a stripe set totally pieced. See how it bubbles up a little? Flip it over and press all the unpressed seams - direction really doesn't matter. Unlike pressing patchwork blocks after each seam to make things lie super flat, pressing the section at this point will cause just a bit of a wobble, which just adds to the overall look of the block - in a good way! 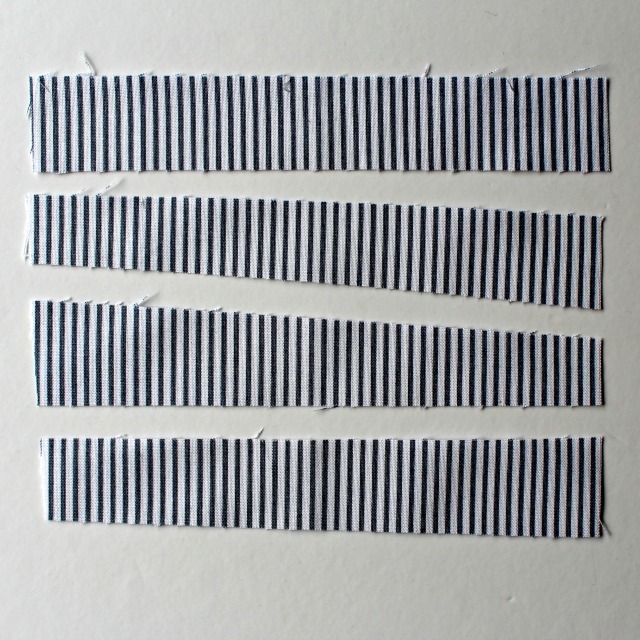 So.... start cutting strips and making stripe sets - as few or as many as you like. I'll be checking in on Instagram midweek, and by Friday, we'll plan on sharing some ideas about how we might arrange our blocks. If you're on Instagram, post progress using hashtags #improvstripesqal and #improvstripes. If you aren't, let me know in the comments how it's going and where I can see your photos, ok? This is gonna be fun! Yessss! This is indeed going to be fun. Have been obsessed this summer with the scraps too small to fold onto the shelves. Have yards of fabric but I cannot seem to let go of the idea that these small pieces MUST be used. Stripes here we come! Thanks. Your quilts are all beyond gorgeous. I need to pick out fabrics today! How many weeks will this run Debbie? Two? I can't wait to do this. You always inspire me in so many ways! Ooooo, now I can't wait to go play in the studio! Have to get a few things done first today though..... I do have some ideas in mind, just have to pull some fabrics so I can get started. I'm having a blast making stripes. It's actually going faster than I had thought it would. It is fun, what a good idea you had starting another improv QAL. Since it was fun to sew along last time in the crosscutquiltsal, I decided to do it again and I am sure I will not regret! Thanks for beeing such a good hostess! I am also here from Exuberant Color blog, and just yesterday I was cutting bunch of Kaffe scraps and now have lots of skinny strips. I see you are pairing with black/white, is it to show colors better and have consistently? I'm a pattern type of person, but will play to get me thinking outside the box- thanks!